Monday night marks the first presidential debate between Hillary Clinton and Donald Trump. It&apos;s sure to be a can&apos;t-miss spectacle, so why not watch it while downing a few drinks to forget about your impending move to Newfoundland? Here are nine places you can watch and take a shot for every cheap shot about emails and tiny hands. 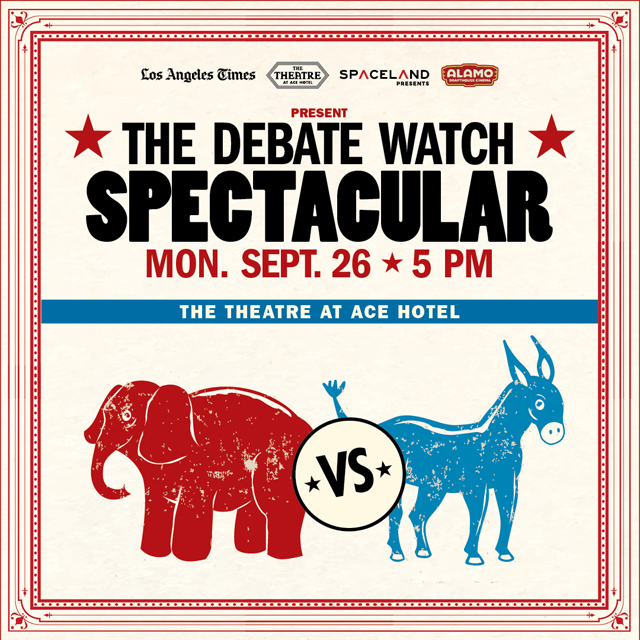 Ace Hotel&apos;s gloriously refurbished theater will screen the debate as part of "The Debate Watch Spectacular," featuring video fun from Alamo Drafthouse, debate analysis from the Los Angeles Times politics team and a lobby DJ set from Tuxedo (Mayer Hawthorne and Jake One). Hosts Rico Gagliano of podcast "The Dinner Party Download" and Christina Bellantoni of The L.A. Times will guide you through. The Theatre at Ace Hotel is located at 929 South Broadway in Downtown L.A. Doors are at 5 p.m. Tickets are $13. You can buy them here. A free downtown option is The Association, a finely decorated (and dim) bar that fancies itself a bit classier than the average neighborhood joint (dress code: "smart, stylish; no sportswear or baseball caps allowed," its website says). The bar will have some unspecified drink specials, and since there&apos;s no cover, you can make the most of it and drunkenly watch in style. The Association is located at 110 East 6th Street in Downtown L.A. There&apos;s no cover, and the event is listed to run from 5 p.m. to 7:30 p.m.
HRC Los Angeles and Hollywood For Hillary are hosting this viewing party at the city&apos;s most popular gay-but-straight-friendly bar. Monday&apos;s happy hour features $5 appetizers and $5 select mojitos. Also of note: Hillary dropped by the Abbey back in 2007, and there&apos;s a video of her visit. 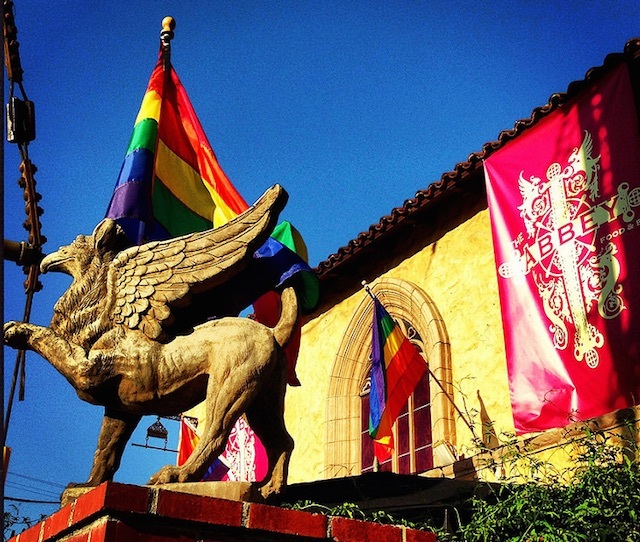 The Abbey is located at 692 North Robertson Boulevard in West Hollywood. The gathering is scheduled to run from 5:30 p.m. to 8:30 p.m. It&apos;s free, and you can RSVP here. If The Abbey is bursting at the seams, there&apos;s also Bar10 down the street, a relatively quieter gay bar with craft cocktails instead of vodka sodas. It&apos;s being put on by the Stonewall Democratic Club, Hollywood NOW, Planned Parenthood LA, the West Hollywood/Beverly Hills Democratic Club and the Miracle Mile Democratic Club, and WeHo councilmembers John Heilman and John Jude Duran will join. The best reason to go? The first 80 people to arrive (the event starts at 5:30 p.m.) will get a free drink ticket, and there’ll be free appetizers, too. 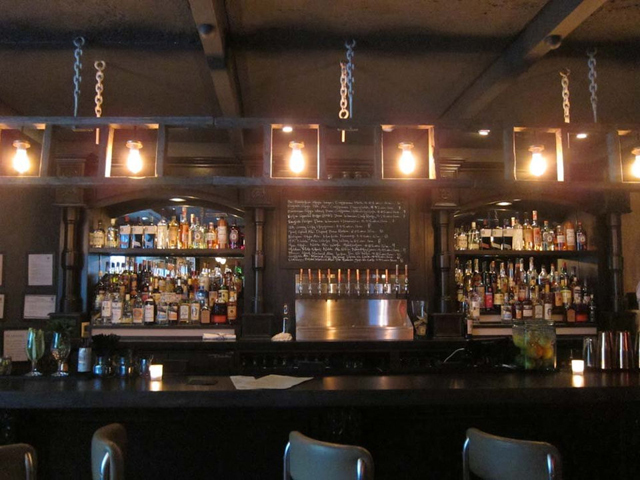 Bar10 is located at 8933 Santa Monica Boulevard in West Hollywood. The event is scheduled to go from 5:30 p.m. to 8:30 p.m.
Silver Lake&apos;s Hyperion Public is a great place to grab a slice of pizza and watch Don and Hills go at it. They&apos;ll be playing the debate and slinging their usual happy hour goods, such as $6 well drinks, glasses of wine and cocktails, and pub grub like chicken wings at three-for-$5. Hyperion Public is located at 2538 Hyperion Avenue in Silver Lake. Their happy hour runs from 4 p.m. to 7 p.m. If you want a nice meal to go with your viewing experience, West Hollywoods Taste on Melrose is a great choice. Theyll be hosting a debate viewing party where customers can watch on one of two TVs in the restaurants atrium. Happy hour drinks will be offered throughout the evening, including $6 house drinks, such as the pomegranate basil sangria, as well as $6 margaritas, beer and glasses of wine, and half-off bottles of wine. Small bites include spicy roasted cauliflower, chicken salad sliders, and apple and caramelized onion pizzetta. 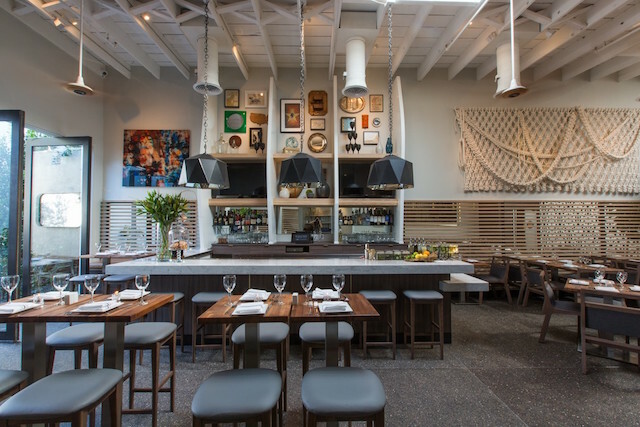 Taste on Melrose is located at 8454 Melrose Avenue in West Hollywood. Their happy hour runs from 3 p.m. to 7 p.m. If your friends&apos; jokes about the debate aren&apos;t enough, you can head to the Hollywood Improv, where comedians Ben Gleib, Paul Provenza and Jackie Kashian will screen the debate and crack wise during pauses and applause — sort of like a "Mystery Science Theatre 3000" of debate watching. It&apos;s an especially good option if you&apos;ll still be working at 6 p.m. when the debate actually starts, as this event begins at 8 p.m. Please note that there are only 60 seats available in total, so get your seat now if you&apos;re interested. Hollywood Improv is located at 8162 Melrose Avenue in Hollywood. "Comedy Juice Squeezes the Presidential Debate" starts at 8 p.m., and tickets are $7 each ($8 with fees). You cam buy them here. Echo Park&apos;s The Lost Knight will showing the debate on the big screen, with happy hour offerings like $5 well drinks, house wine and draft beers, as well as half-off appetizers. There are also two drink specials, depending on which side of the aisle you fall: For Trump, there&apos;s the ironically dubbed Trumparita, and for Hillary, a $5 Slow and Sour, which The Lost Knight&apos;s head-of-operations Aaron Sine tells us is "strong enough to get the job done, but leaves a sour taste in your mouth." The Lost Knight is located at 1538 Sunset Boulevard in Echo Park. Their happy hour runs from 3 p.m. to 7 p.m.
Of course, your favorite dive may also be playing the debate. But what better dive is there than Los Feliz&apos;s Ye Rustic Inn? Monday nights have their best happy hour offering — the $25 wing special, which comes with a pitcher of Bud or Bud Light and 12 wings (we never claimed it was fancy around here). In Los Feliz, 1739 Public House down the street also will be screening the debate if Ye Rustic gets packed. Ye Rustic Inn is located at 1831 Hillhurst Avenue in Los Feliz. Happy hour runs from 4 p.m. to 7 p.m., with the Monday wing special offered until 9 p.m.